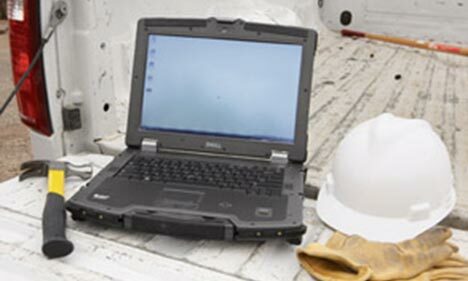 Ridgid has just announced their partnership with Dell to offer a series of rugged laptop designed with the tradesman in mind. These new laptops in conjunction with Ridgid's SeeSnake LT1000 Interface will allow SeeSnake users to monitor, record, and save everything the SeeSnake camera picks up. This is a smarts move for Ridgid, which allows them to offer the complete inspection package. The three Dell Laptops range in their amounts of ruggedness, from Fully Rugged to Everyday Use (which is basically just a standard laptop). The Fully Rugged Latitude E6400 XFR is not cheap, and comes with a starting price of $4754. But at that price you get Dell's Ballistic Armor protection system that can withstand falls from heights up to 4 feet. The body of the laptop uses PrimoSeal technology that allows for the highest level of water and dust resistance. To keep things cool, the QuadCool thermal management system allows the XFR to operate in temperature extremes without compromising performance. Besides the laptops, also available is a Semi-Rugged Multi-Touch Tablet PC that can withstand drops of up to 3 feet. Included with all models is some Ridgid specific software: SeeSnake HQ, a 6 month subscription of RidgidConnect, Ridgid Electronic Resources, and additional Ridgid Software.